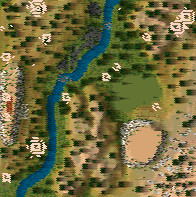 This small map is heavily forested. There are plenty of wolves, bears, rabbits and random diseases and bandit invasions to toy with you. There are building and unit resctrictions as well. Only goal is to raise 25,000 gold, but it's mostly to just enjoy the map. Yea, I went a little overboard on the deer population, and for that, I apologize. A nice and well-playable map with plenty of wood, in deed, so that you have to take care of preventing the overgrowing landscape. The market gets overheated to achieve the demanded gold amount ... and the bandits are easy to repel, hadn't any problems to get them under control. Maybe the trade of food could be totally restricted. Sometimes ruffians try to attack your castle. Deal with them in the usual manner: build palisades, archers and crossbow shooters (sry, I don't know the English terms in the game).